I had my first proper encounter with this breed on a recent visit to my local county show and I was instantly enamoured by its diminutive size and delicate frame. The Boreray is the rarest of our native breeds, in fact it’s the only one to appear in the RBST critical list with around three hundred (for perspective that’s much less than the Siberian Tiger) breeding females remaining. I myself can’t fathom why this is. The breed is ideally suited to the smallholder and it’s hard to imagine why you would look anywhere else if considering sheep for your land so I’m going to put the case for this hardy little breed in the hope you’ll agree. Boreray is a small island of the uninhabited St Kilda archipelago set some way off the west coast of Scotland in the North Atlantic and this is where the majority of the population are found to this day. 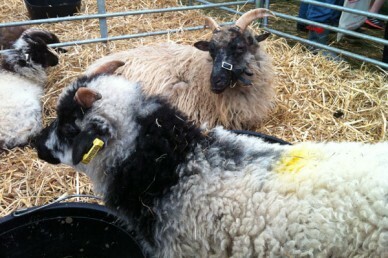 They are the only surviving link to the Scottish tan-faced breeds traditionally farmed by crofters until being displaced by blackface varieties and it is this cross that produced the Boreray. The current island flock has been feral since the St Kildians were evacuated from the islands, due to the isolated position and consequent economic problems, in the 1930’s. The sheep are a small (approx 55cm at the withers) but, as you might imagine, hardy breed with ewes rarely exceeding 30kg and rams 45kg. They are a short tailed breed, meaning no docking required and although some darker examples do exist, most have a creamy white fleece with black, tan or speckled markings on the face and legs. An unusual characteristic, that it shares with its Soay cousins, is that the fleece is naturally shed in the spring. Shearing is not ordinarily required although ewes that fail to lamb or older animals may need some help in this department. For keepers that use fleece this can be plucked when loose instead. In addition to the self-shedding fleece Boreray sheep also display a much higher resistance to foot rot and to flystrike making them as close to ‘low-maintenance’ as you are likely to find. Both sexes are horned. Borerays are excellent mothers and lamb easily, often well into their teens, with very few problems and average around 140% for managed flocks. The meat is well flavoured although slower to mature than commercial breeds and animals would usually be slaughtered between 1 and 2 years of age, known as hogget, or as mutton. I know you’ll be itching to get your hands on some now so the question might be where do I got hold of stock considering the tiny numbers available? A search on the internet will throw up a selection of keepers but my best advice would be to contact the Soay Sheep Society http://www.soaysheep.org initially as it will have contacts for breeders and information on available stock. The website also has information about registration which is vital for the continuity of the breed. I’d love to see this hugely practical breed move to the right on RBST lists and I’m sure they would too. Soay – Although genetically distinct from the Boreray, the Soay, also from the St Kilda islands, shares many characteristics with the Boreray. Still an ‘at risk’ breed but you will find mainland stock more easily. North Ronaldsay – Again shares many characteristics with the Boreray. Natively is adapted to seashore living and eats mainly seaweed for a large proportion of the year. As a consequence of this dietary adaptation the breed can be susceptible to copper poisoning from trace elements in the environment and in feedstuffs. Wool is popular with crafters.